Angela and I went to the Columbus Museum of Art recently to view the Radical Camera exhibition about New York’s Photo League. The photos were amazing, and the stories behind them equally so. It was moving and thought provoking in many ways. It’s been a long time since I’ve been to the CMA. Some time since my last visit they’ve added a number of interactive elements. At the end of the Radical Camera exhibit was a big board covered with sticky notes. 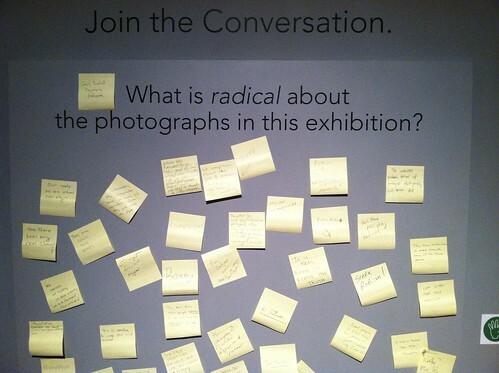 The board was labeled “Join the Conversation” and asked the question “What is radical about the photos in this exhibition?” The sticky notes revealed previous guests’ opinions. 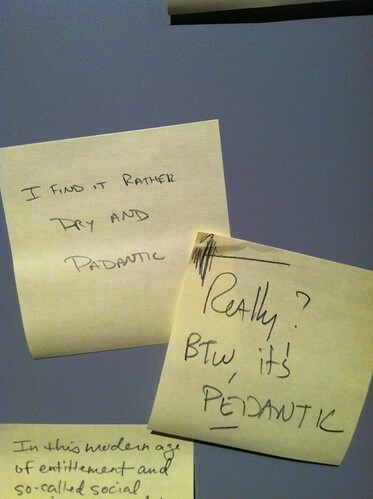 I couldn’t help but laugh out loud at the pedantry exhibited in this pair of notes. We didn’t have much time to see much else on display at the CMA, but I did notice that most exhibits had a “Join the Conversation” board, which I think is a nice touch. There were also a number of kid-friendly hands-on displays, and a “Wonder Room” full of stuff to do. We definitely need to make another trip there, with more time, to explore all that’s on display.